Time always seems to go so quickly when you’re traveling. It’s heightened living at its best, and fate seems to rush it while I do my best to try to slow things down. In this case, I wanted to draw out the feeling of the sun’s warmth on my face, the cold rush of the streams against my hot skin, and the refreshing sensation of breathing in the mountain air. 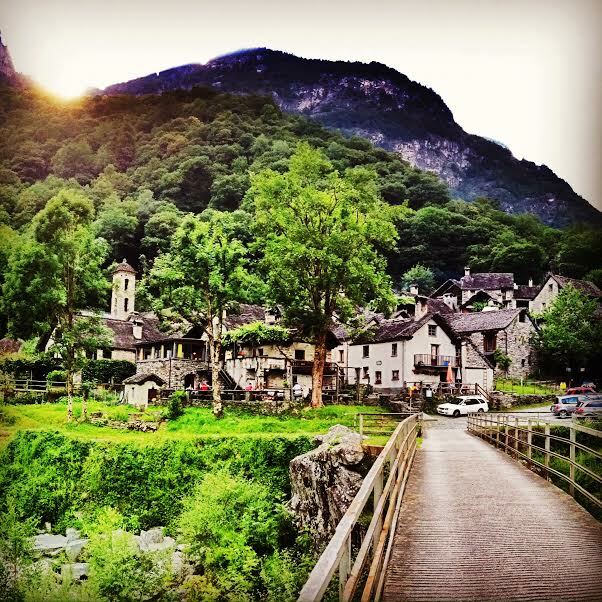 Still, it was our last full day in Switzerland, and the question loomed: What to do? There was one valley nearby that we had yet to explore, but that valley did not promise Alpine peaks, and so the Alps called and we heeded their invitation. We returned to the Val Bovona, the Basodino Glacier, and the cable car ride that both took our breath away and delivered us into the heart of that glacier. First, however, lunch was in order, and with fantastic Italian food all around you, you do not substitute with a protein bar. 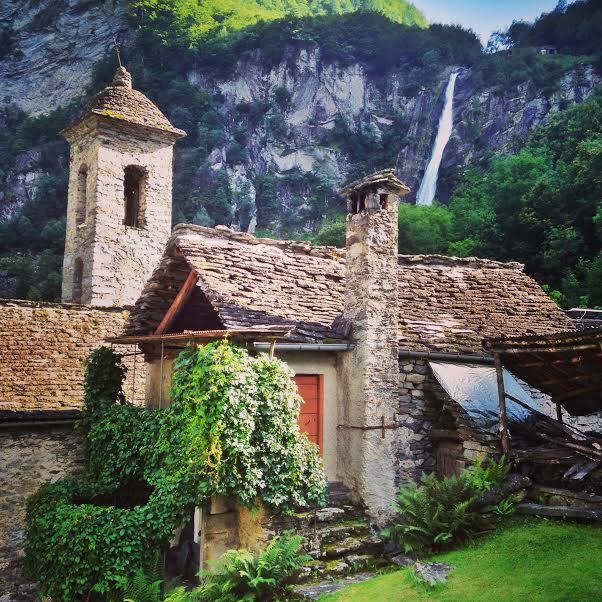 We stopped again in Foroglio, the enchanting stone village, and the Ristorante la Froda, a farm-to-table dream in the middle of a fairy tale. The lentil dish was astoundingly good, and the white Merlot a perfect match. 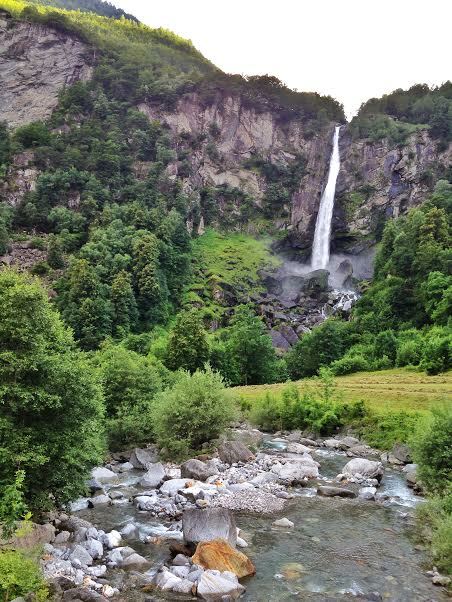 We followed up the long leisurely lunch with a return visit to Foroglio’s waterfall. Watching water spill over the side of a mountain is nothing short of mesmerizing — maybe too mesmerizing, as we checked the time and suddenly needed to rush to make the cable car if we wanted enough time to explore up in the clouds before the last descent at 4:45. With some mad driving skills by my sweetie that can only be described as impressive, we flew, just making the cable car. The Alpine thrills would be ours today after all. Today we decided to go a different route, and began climbing up. It can’t be that far up, can it? So we climbed and climbed, up, up, up. We are almost there, we have to be almost there, but where is there? “There” is the magnificent view that surely awaited us at the top. “So how long do you think we have been climbing UP?” my love asked. “Oh, about 45 minutes,” I said. “Try an hour and 45,” he replied. We had to turn around and go back. In a battle between me and Mother Nature, I am keenly aware she will always win, and stranded on an Alpine glacier for the evening is not my idea of fun. I took a moment to take it all in and was reminded of a favorite childhood book, “Heidi,” and for a moment, I knew the happiness that that character felt living on the mountain. Simply majestic. Moments in time to be deeply absorbed before reality whisks you away to your real life, that, while treasured, is not here. “Enjoy,” whispered the universe, and so I did. It was a warm day, and we were more than a little … err … sticky. The river was looking very inviting, gushing over the boulders, creating those magical swimming pools that were begging us to visit, almost pleading — and who were we to argue? 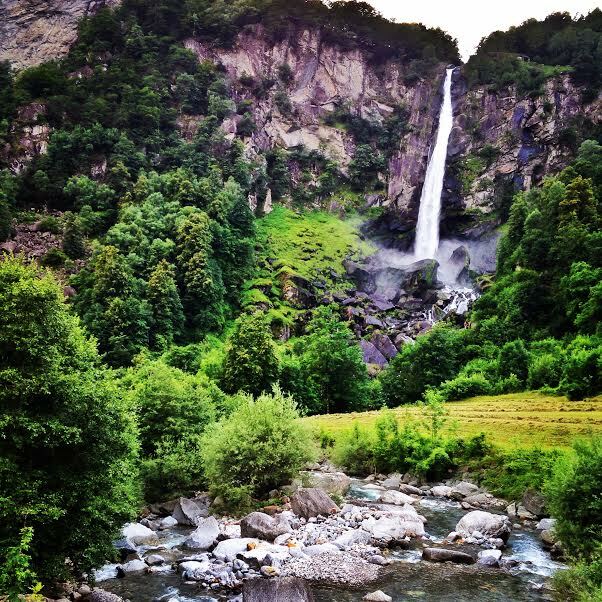 It was the highlight of our day, jumping all hot and sweaty into that swimming pool at the bottom of a valley teeming with waterfalls. Can someone please pinch me? This cannot be real. Immersed and looking up at the water spilling down the ragged, jagged crevices of this mountain valley. Sigh. Heaven. How to top off a last night and a perfect day? Ask a local for a dinner recommendation! DaVino restaurant on the lake in Locarno it was, and with homemade ravioli stuffed with spinach, veal and beef, we were anything but disappointed. Planning our next adventure is tempting, but no, not tonight. Tonight is for savoring where we are and not letting this adventure end too soon. 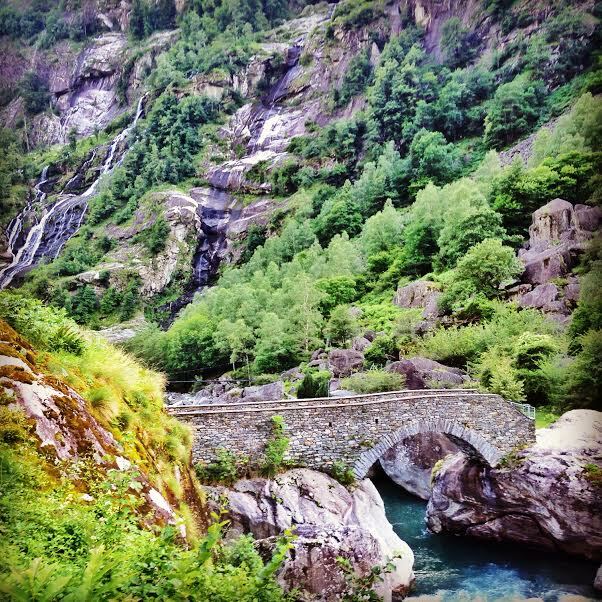 Driving through the valleys that spread out from Lake Maggiore is, for me, one of life’s great thrills. It’s just so darn charming and breathtaking, a feast for the eyes. 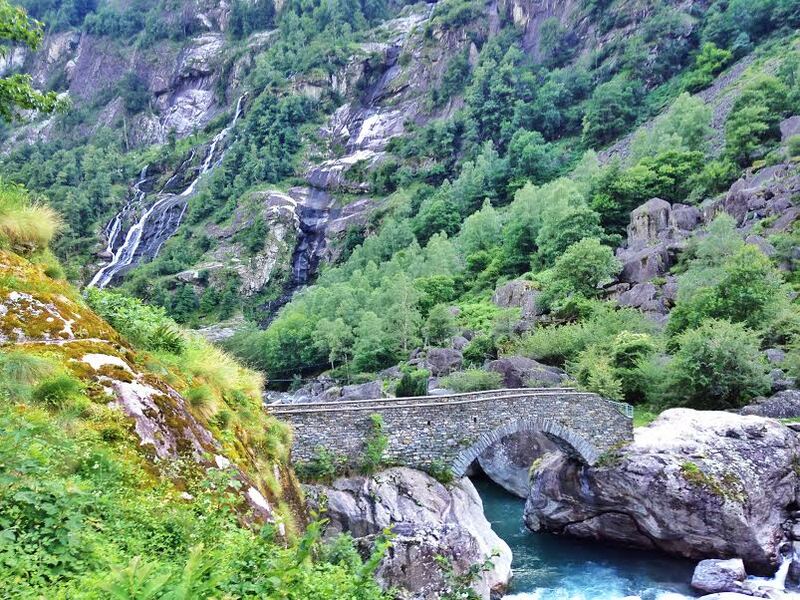 Today we would explore the Valle Maggia and and the valley it leads to, the Val Bovona. Once you turn into the Val Bovona, things get really interesting. You’re deep into the heart of a valley and the Alps are on the other side, playing peek-a-boo with their snow-capped summits. 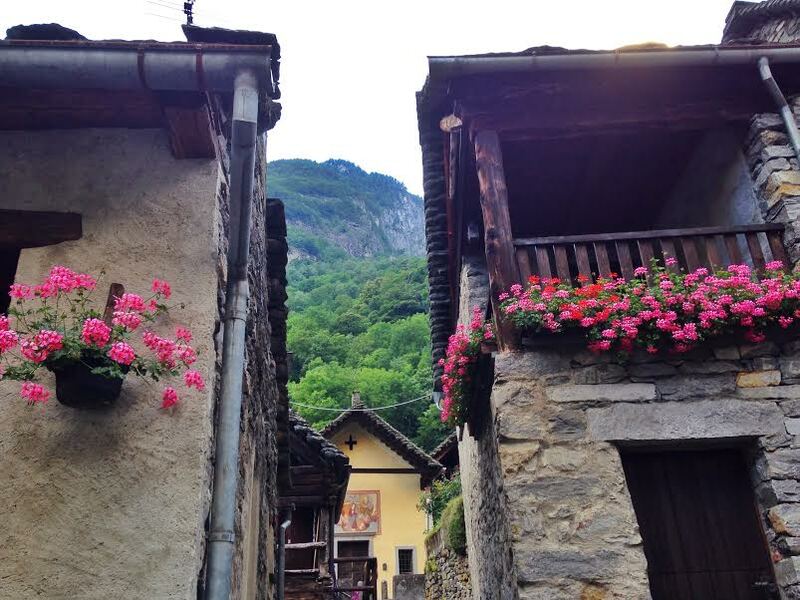 There are more picturesque little stone villages that don’t quite feel real, and I don’t tire of it one bit. Our destination is the end of the line in the town of San Carlo, and there we find a cable car that will take us way, way up. Ascending above 1,000 meters of altitude, the ride up to Robiei is an event in itself, offering impressive views of the U-shaped Basodino Glacier. The view seems straight up, as if you were standing at a nearly upright wall filled with deep crevices, magnificent waterfalls spilling over the surface. And then the snow caps appear all around you. 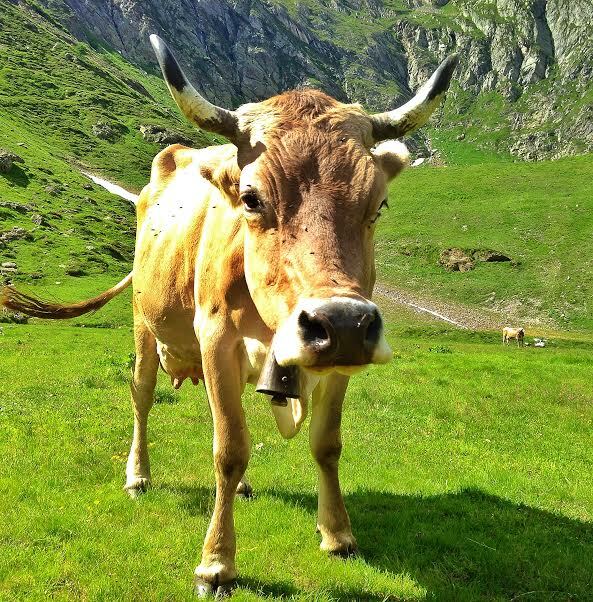 Sigh … The Alps: there’s nothing quite like the majesty of being in their presence. 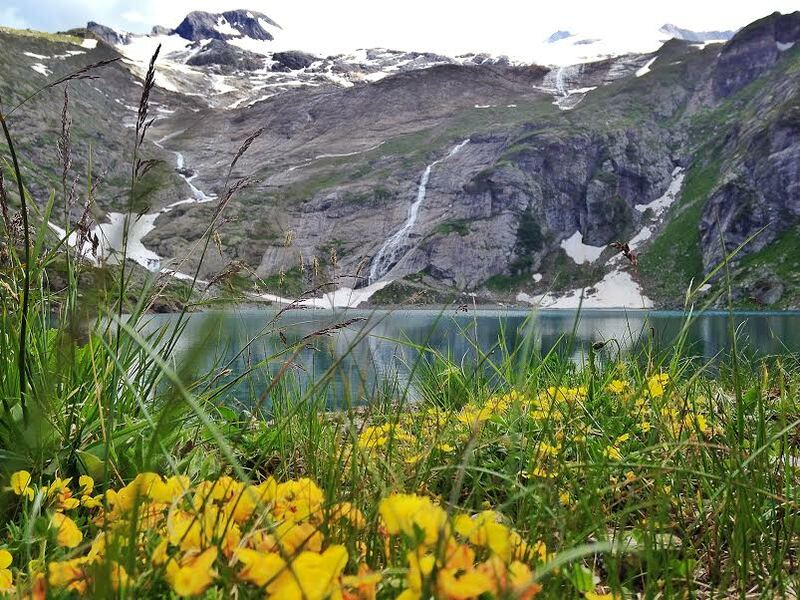 Once our feet hit the ground at Robiei, we headed left, facing the glacier, walking through a tunnel, until one of the area’s gorgeous lakes appeared. Lakes in the Alpine peaks? It just got even better! Today, we got a late start due to a leisurely morning, and soon it was time to run back to the cable car to catch the last one going down for the night. This was not a place we were prepared to get stranded. We made it. On the cable car down, staring out at the beauty, I caught my love’s eye and we both had that smile of disbelief on our faces. Are we really here? And isn’t it so exquisitely beautiful? We stopped at the town of Forglio. Is this place real? 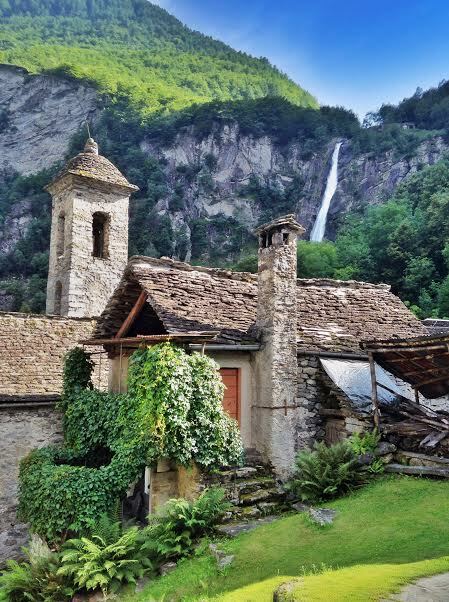 Set at the base of a majestic waterfall, this charming village twists and turns up a stone path, affording more views of the surrounding brilliance. 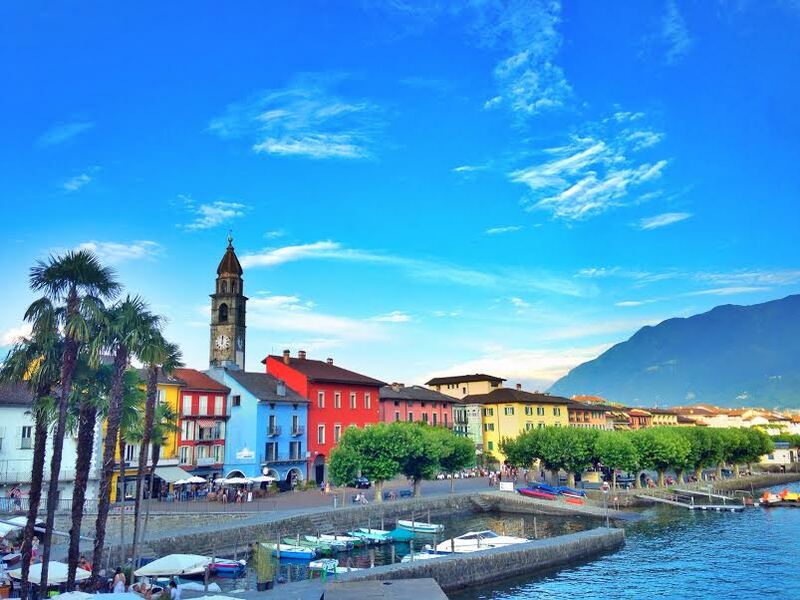 Upon returning back to the lake, instead of heading back to Locarno, we headed to neighboring Ascona, a fairy tale town of twisting cobbled streets and brightly painted buildings that spill into Lake Maggiore. Here we had dinner, basking in the glory of a truly remarkable day that seemed more out of a dream. To top all that off, my dinner of shrimp risotto almost made me fall off my chair. Deep, deep gratitude for all of the sensory pleasures of this day!